​I don’t read series generally. Other than Tolkien’s masterpiece, most series seem aimed at young adults. So when one of my favorite authors published a sequel to a book I thought was wonderful, I was skeptical but cautiously optimistic. 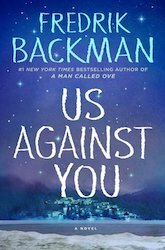 Us Against You is a follow up to Fredrik Backman’s Beartown. It’s the story of a small Swedish town facing economic decline. The only thing Beartown has is its hockey club. When a violent event rips the club and the town apart, there may not be a way back. Us Against You picks up in the aftermath of Beartown. I wasn’t a big fan of the first 75-100 pages because it was mostly backfilling, reminding readers of Beartown what happened in that novel, or alternately setting the stage for new readers who missed out on Beartown. Then the new storylines kick in. The sequel develops a number of stories –perhaps even too many? – and as a result, Backman opts for very short segments within each chapter, focusing on several scenes in different settings. It felt a little frenetic to me. Somehow, however, Backman still manages to manipulate our emotions in a way that’s masterful. Sometimes it’s by a surprise event, sometimes it’s with another tragedy, sometimes it’s a slow burning development. Very few books make me tear up, and most of them are World War II stories. But Backman wrecks me. His stories seem so simple on the surface, but underneath the surface he manages to play on the right emotional strings to hit us over and over with “all the feels.” He’s done it again with Us Against You.